People are injured on occasion by products which are dangerous. Manufacturers and sellers of dangerous products may be liable for the injuries or death caused by these products. Dangerous products may be prescription drugs, cars and SUV’s (rollovers, airbags, etc. ), medical devices, airplanes, industrial equipment, and a variety of other consumer products. The Alabama Manufacturer’s Liability Doctrine provides that manufacturers of unreasonably dangerous products may be liable if the product causes injury or death to a person. The judge or jury determines whether the product is unreasonably dangerous, generally with the aid of testimony from experts. The product may have a marketing defect, a design defect, or a manufacturing defect. A marketing defect usually is a failure to adequately warn the user of the dangers of the product. A design defect means that the product was designed with a danger that could have been substantially reduced or totally avoided with an alternate design, or that the product’s inherent danger was too great given the product’s utility. A manufacturing defect means that the particular product’s danger arose from a fault in the manufacturing process. 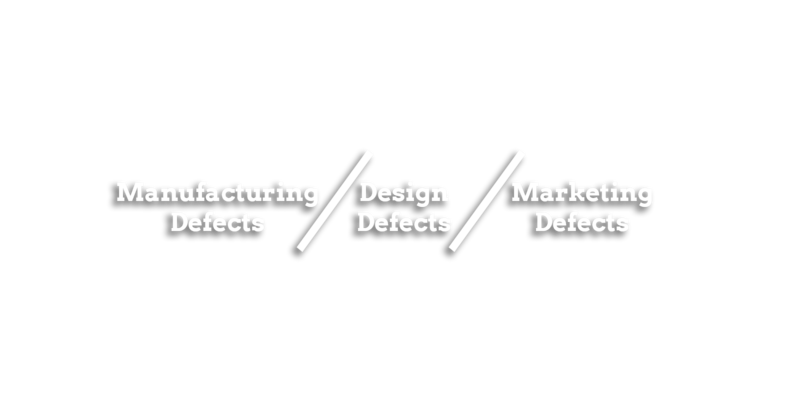 Some products can be defective due to marketing, design and manufacturing. The Alabama Manufacturer’s Extended Liability Doctrine attaches liability to those who supply or sell defective products, in addition to those who manufacture defective products. To establish that a product is “defective” and “unreasonably dangerous” when applied to its intended use, the injured person must prove that the product does not meet the reasonable expectations of an ordinary consumer as to its safety. The injured person must also prove that the product was not substantially altered prior to the injury and that the defect caused the injury. The limitations period to file a case under the Alabama Manufacturer’s Extended Liability Doctrine is two years from the date of injury. However, under the theory of continuous tort or exposure, such a case may be filed within two years of the day on which the person was last exposed to damages. Alabama law also allows product defect claims of negligence, wantonness and breach of implied warranty of merchant-ability. Under a claim of breach of implied warranty of merchant-ability, the injured person must prove that the product was not fit for the ordinary purposes for which such goods are used. Alabama Code Section 7-2-314(2)(c) (1975). The limitations period to file a claim for injuries resulting from a breach of implied warranty is set forth in Â§ Alabama Code Section 7-2-725 (1975), which provides that “[a]n action for breach of any contract for sale must be commenced within four years after the cause of action has accrued,” Section 7-2-725(1), and that “a cause of action for damages for injury to the person in the case of consumer goods shall accrue when the injury occurs,” Section 7-2-725(2). The statute of limitations for a claim for injuries under negligence or wantonness is generally two years from the day when injury occurred. The judge or jury also determine whether the danger presented by the product caused bodily injury or death. Injuries caused by products can be devastating. An experienced attorney at Burns Garner Law Firm can look at the facts of your case and the applicable law to determine whether the product that injured you was unreasonably dangerous and whether you are entitled to be compensated for your injuries. We have handled product liability claims in the past and continue to do so presently. If you have suffered an injury from any product that you feel is unsafe or defective and would like to know more, please contact our law office at (256) 547-5466.